To create your ad, head over to Facebook Ads Manager and begin a new ad. Campaign Objective: the best objective to set for this type of ad is "Messages". This will optimize your ad for viewers most likely to interact with your Messenger bot. At the “Ad Set” level, choose Messenger as your message destination. Move on to the “Ad” level. Under “Identity”, select the Facebook page used when setting up your campaign. Important: as a Click-to-Messenger Ad doesn't have a landing page to inform your customers about your product and offer, you have to make it very clear in your ad's images and copy. Make sure your customer has a clear idea of what you're selling, and what the offer is. 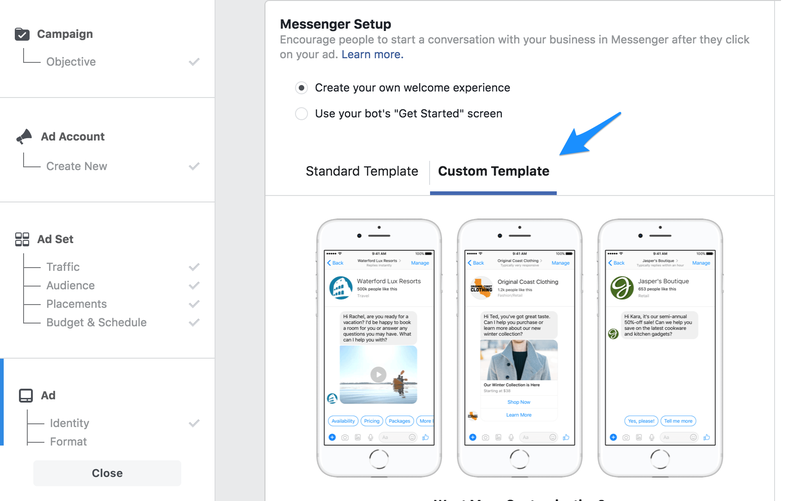 When you get to “Messenger Setup”, choose “Custom Template”. Click “Get Started” to add your chatbot’s code. Select “JSON” in the custom template editor. Clear the code shown, and paste the code from your LandingCube campaign (you can get this code again by clicking “More Actions” and “Publish” on the Dashboard). Ensure you click at the very top of the code field, in order to clear the entire base code (which you will replace with the LandingCube code). You may wish to preview how your chatbot sequence will appear. You can do so by clicking “Preview in Messenger”, to the right of the JSON Message Setup. Once you are happy with your ad, click “Confirm” to publish your ad.